Please note: I suggest using this layout as it solves some of the grounding issues that may cause hum by following other layouts. keep the wires short and close to the chassis and you should get a very quiet / hum free build. 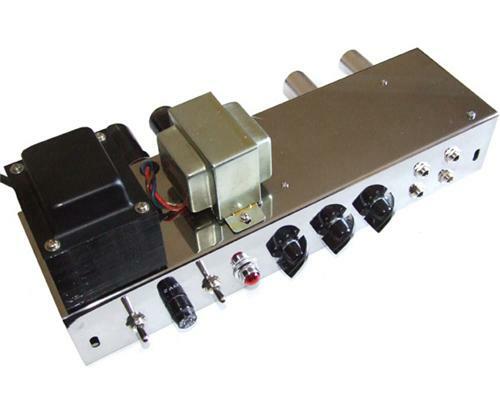 We do not supply a step by step build manual for this amp, the layout is simple to follow and it is expected that the builder has some relevant experience. Detailed pictures are available on request. Parts will be picked once the order is received and generally shipped within 3 to 10 working days from receipt of order. We try to keep all parts in stock to satisfy kit orders, however if there are part shortages that will take longer than 2 weeks we will contact you within 3 working days of placing the order, Please contact me for estimated shipping times prior to ordereing if concerned. Cabinets are made to order and shipped separately, dispatch times are typically 2 to 4 weeks for the cabinet. For UK residents use the shipping coupon code / SHIP4FREE \ for free shipping.